Ingredients: Himalayan salt, organic essential oils of bergamot and ylang-ylang. 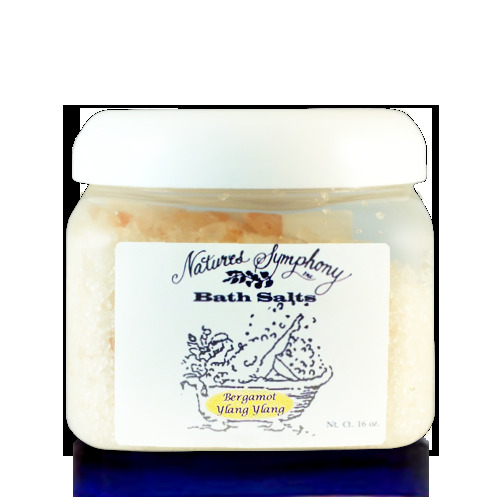 The salts are infused with Ylang Ylang, one of our most popular, certified pure organic essential oils. The scent is exotic - very sweet, heady and euphoric. In Indonesia, it is traditional for newlywed couples to find Ylang Ylang blossoms spread on their marriage bed. Ylang Ylang is sensual, relaxing and uplifting. It is best known therapeutically as an aphrodisiac, releasing emotional blocks that prevent sexual enjoyment. During your bath, the aroma of ylang ylang essential oil and the contact of the salts and oils with a large area of your body will help release emotional blocks. There are 16 ounces in the jar, and we recommend that you use 1 oz. or 1/8 cup per bath in tepid or warm water. Not advisable for people with known heart deficiencies. Be careful when you finish bathing - you may need to restrain your partner.